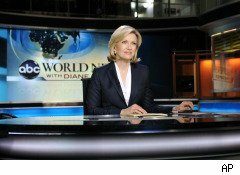 Diane Sawyer's first night as host of Disney Co.'s (DIS) ABC World News Tonight was greeted by a lot of fanfare about how little fanfare greeted it. Sawyer herself wasn't one of the miscues; the reviews of her performance were generally favorable. Shales seems to be positively in love with her, citing her "gorgeousness" as a reason to watch the show, and declaring that ABC "stands a very good chance of having the best-anchored newscast on television, anywhere." The notable dissenter was Kyle Smith at News Corp.'s (NWS) New York Post, who mainly seems annoyed that Sawyer, during her interview with Ahmadinejad, didn't slap a pair of handcuffs on the Iranian president and drag him off to the Hague then and there. "Sawyer may be the Respectable Lady," he writes, "but nothing she does is going to make ABC World News anything other than what it is -- a stale plate of info-leftovers for shut-ins, news for people who aren't all that interested in news." At The Daily Beast, Rebecca Dana made the obvious comparison between Sawyer and CBS's (CBS) Katie Couric, who's been doing the whole female-solo-anchor thing for a few years now. Watched side by side on Monday night, in a way no viewer will ever watch them, the two complemented each other nicely. Sawyer covered health care while Couric covered holiday airport delays, and then they switched. Sawyer was all dark colors and neutral makeup. Couric looked kicky in red and pearls. Both seemed perfectly at ease in their chairs, as well they should: Women are now in the majority in the fast-contracting, but still vitally important, role of network evening news anchor.